As gospel literature bugs, we have gospel literature ready to give out. It fills our shirt pockets and pocketbooks. But before we leave our homes to enter the mission field of those who need to hear, we need to stop and arm ourselves with prayer. Ask the Lord to open doors of opportunity. 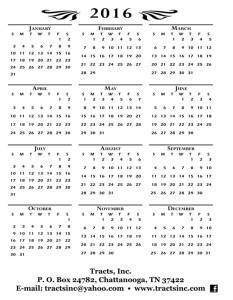 Attention all gospel literature bugs: The 2016 Gospel Calendar is now available. These handy 4×6 cards have a calendar on the front side and a gospel message on the back. The message is the return of the Lord and asks the reader if he or she is ready should the Lord return today. These are ideal to put in Christmas cards, gift baskets, and treat boxes. Isaiah 40:5 says, “And the glory of the LORD shall be revealed, and all flesh shall see it together: for the mouth of the LORD hath spoken it.” Each day we pray that the eyes of the lost will be opened as they hear the Word of the Lord so that they will rejoice in their salvation when everyone sees the glory of the Lord. I am praying the gospel tracts from you and praying for you.